Is recent stock market weakness a temporary “correction” in an on-going bull market advance for stocks, or the start of a serious bear market? Our reading of the “tea leaves” on the health of the underlying economy and the implications for corporate earnings prospects put us in the correction camp. Yes, most everyone knows the economic expansion is the slowest on record. And yes, everyone is also aware that there is plenty of bad news around the globe. But slow growth in the present case should not be confused with fragility. And the expansion should prove, once again, to be resilient—just as it did in the face of: significant intrusions by the government into the economy, the fiscal cliff, the Eurozone melt-down fears of 2011, other geopolitical troubles, etc., etc. The on-going expansion and its durability should, in turn, provide resiliency for the stock market in the face of the current bad news as well. Consider that consumers and businesses remain cautious and this posture is reflected in their conservative use of debt and spending patterns. Banks are better capitalized than any time in many decades. Overall inventory levels are lean and not excessive (as the table strongly suggests). Financial liquidity is certainly not “tight” and tightness is often one hallmark of long-in-the-tooth businesses cycles. Underlying economic fundamentals are improving in contrast to deteriorating conditions that usually occur before economic trouble. This is the most hated bull market perhaps ever, since it has left so many pundits behind, and investor psychology is hardly euphoric as is the case when markets peak out. Economic releases that are starting to roll in from July confirm the underlying resiliency. One of our favorite releases, due to its record as a pretty decent leading indicator, remains the Purchasing Manufacturing Index (PMI)–and in particular its new orders sub-index. ”“A PMI® in excess of 43.2 percent, over a period of time, generally indicates an expansion of the overall economy. Therefore, the July PMI® indicates growth for the 62nd consecutive month in the overall economy, and indicates expansion in the manufacturing sector for the 14th consecutive month. The past relationship between the PMI® and the overall economy indicates that the average PMI® for January through July (54.4 percent) corresponds to a 3.7 percent increase in real gross domestic product (GDP) on an annualized basis. In addition, if the PMI® for July (57.1 percent) is annualized; it corresponds to a 4.6 percent increase in real GDP annually. Since the expansion began in 2009, real GDP has grown about 2% per annum. The 3-4% trend being suggested by the PMI is good news in this context, of course. We do need though to point out two things. Recent growth in the manufacturing area—for the first time in decades—is outpacing the growth in the economy at large. We expect this to continue as a “silent revolution” in manufacturing continues to unfold. But, we also must point out that July’s run-rate in new orders is close to “red hot” and, therefore, it is reasonable to expect some cooling in new orders and the PMI over the next few months. But cooling from “red hot” is not to be confused with trouble. As a result, prospects for both the economic expansion and the up-trend in overall corporate earnings look healthy. Bear markets are usually associated with a meltdown in earnings. Such conditions will inevitably evolve down the road. Those times are still very likely well off into the future. What about the prospects of Federal Reserve rate hikes? 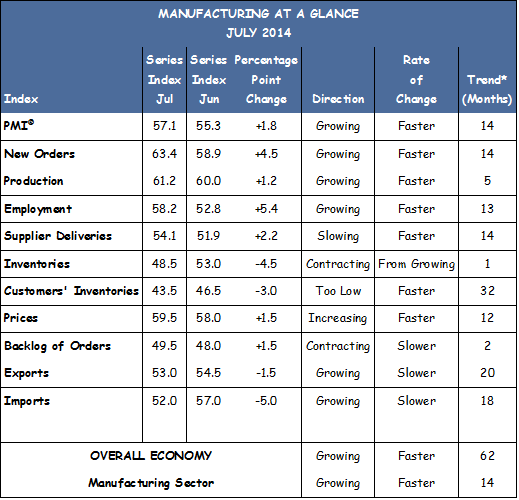 Isn’t better economic data like the July ISM fodder for rate hikes and won’t higher interest rates damage the economy? This “good news is bad news” view is likely contributing to the present level of investor angst. But the Fed allowing rates to normalize at higher levels in the context of its extraordinary liquidity-supplying measures of recent years is not the same as Fed “tightening” which can render the expansion brittle. Someday the Fed will indeed need to tighten to combat excesses in debt accumulation and inflation in this business expansion. But such conditions are also likely quite some years off yet. Has the correction run its course? Many factors impact stock prices in the short run. Unfortunately, most of these short-run factors operate in unpredictable fashion. Adding to the heightened fear, uncertainty, and doubt that’s prevailed since the ’08 financial panic, is awareness by many that August and September are historically weak stock market months. The good news is that “widely recognized” often means already factored into the thoughts of many investors. As long as the underlying economic fundamentals remain reasonably healthy and resilient, corrections will ultimately give way to still more phases of the economic and stock market advance.